Our motorcycle lifts have been designed to reduce and eliminate workers' fatigue by elevating motorcycles and ATV’s to comfortable working heights. Easy-to-use and exceptionally durable, they’re the very best choice for any motorcycle enthusiast. 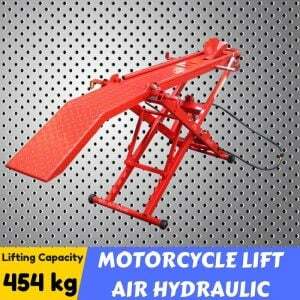 This motorcycle lift can lift up to 454kg. For added ease of use, it has a ride on tray and can be moved around as it is set on castors while keeping the bike secure with the front wheel vice. Great for working on motorbikes and scooters whether at home or in a commercial garage. MOTORBIKE not included! Product Assembly: A small level of assembly is required. Shipping Dimensions: 150kgs (191x80x24 cm). Note: Product images are for illustrative purposes only and may differ from the actual product. Colours of actual products may also appear different to those shown on the site.